After a long hiatus, the Indian and American governments are finally going to hold the much-awaited Trade Policy Forum (TPF), to iron out several bilateral trade and investment issues, on November 25 here. US Trade Representative (USTR) Michael Froman, who will be co-chairing the high-level dialogue with commerce and industry minister Nirmala Sitharaman, will be leading a high-powered business delegation. 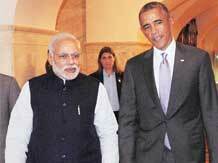 This will be the first trade dialogue with the US under the Narendra Modi government. The TPF this year is after a gap of almost two years. In this time, the two countries had battles on a variety of issues concerning trade and investment, especially in the areas of intellectual property rights (IPRs) and patents. They've taken each other to the World Trade Organization's dispute settlement body over a range of issues, from import of poultry to steel rods. The TPF will be preceded by the first meeting of the high-level intellectual property working group, decided on during the recent meeting between Modi and US President Barack Obama. In recent years, India has come under strong attack from American pharmaceutical companies, as well as manufacturing ones, with severe complaints on the taxation system, the government's emphasis on domestic procurement and alleged lack of innovation and research. Deputy USTR Wendy Cutler had recently met commerce secretary Rajeev Kher to prepare for the ground work - both sides will have a big list of items. The TPF is the premium forum for bilateral trade and has five main focus groups -agriculture, innovation and creativity, investment, services, tariffs and non-tariff barriers. Earlier this month, USTR Froman said the TPF would be "an important opportunity" in advancing of issues concerning bilateral trade, with "constructive, face-to-face discussions". The USTR in its 2014 'Special 301 Report' retained India as a 'Priority Watch List' country for having a weak IPR and patent regime. For the first time, it also launched an 'out-of-cycle review' to keep a close monitor on Indian IPR laws. In July, India won a long-standing dispute with the US on steel exports. The US had imposed heavy import duties on Indian steel products. However, India faced a major defeat in the hands of US authorities in a poultry import case at the WTO that was initiated in 2011. India had banned poultry import from the US, fearing spread of bird flu. Both sides have set an ambitious target of achieving $500 billion worth of annual bilateral trade in goods and services from the present $96 billion. "This will be a good time to discuss all outstanding issues and deal with it with a fresh, new outlook. We cannot keep shooting each other without sitting and dealing with those together. There are many issues that both these countries need to look at and move on," said Robinder Sachdev, director of India affairs, US-India Political Action Committee (in Washington).